"Start your day the veggie way! Say good morning with a great-tasting breakfast that is ready when you are. You'll love this hot, delicious, make-in-minutes veggie meal. It's eye-opening meets mouth watering!" Before I comment on the product, I'd like to give props to whoever took the photo for their packaging. With perfect lighting and plate decoration, the bites look just like a country-style scramble encased in a light, flakey, toasty coating. It's hard not to get excited when you see the picture. Try as I might, I could not not make this product look as nice in my photos. The eggs aren't full and fluffy like in their picture. They're actually small squares of egg that look like tofu. Their picture showed distinct colorful red and green pepper pieces. The bites I made didn't have much color. They're insides were mostly a combination pale yellow and a gray meat color. Okay... so there are very few products that look as good in person as they do on the package. I can live with that. All exaggerated imagery aside, I really liked this product. I've been a fan of Morning Star's veggie sausage and veggie bacon for sometime. So much so... some mornings, I have a hankering for veggie meats over the real thing. 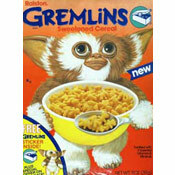 This made me a pretty good candidate to enjoy these new breakfast bites. While they might not really look like they're filled with a fluffy, colorful country scramble, they do taste like they are. There's a definite flavor of red and green peppers. The egg substitute tastes like eggs. You sense a hint of cheese and the veggie sausage adds hearty real-sausage texture and flavor. The "multi-grain breading" is sort of non-descript flavor-wise, but it works well to hold the other flavors together. It should be noted that it takes oven baking to make the coating crispy. I would strongly suggest that anyone making these follow the oven directions as opposed to the microwave instructions. I suspect even people leery of veggie substitute products would enjoy these bites. There's so much going on in terms of flavor and textures, you barely notice that you're dealing with veggie sausage and an egg substitute. 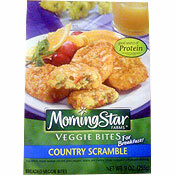 If you can get them at a decent price, I would definitely give Country Scramble Veggie Bites a chance. An Eggs Florentine variety of these bites are also available. If you've tried them, please post a note below. What do you think of Country Scramble Veggie Bites? I love these veggie bites, they are the BEST! But... have they been discontinued? I can not find them anywhere anymore. I believe in eating meat. I love meat, but this tasted great. These things are FANTASTIC! A little pricey but I really, really, really enjoy them. I'd like to know how to make them at home from raw ingredients.